This paper presents the agent-based model INFSO-SKIN, which provides ex-ante evaluation of possible funding policies in Horizon 2020 for the European Commission’s DG Information Society and Media (DG INFSO). Informed by a large dataset recording the details of funded projects, the simulation model is set up to reproduce and assess the funding strategies, the funded organisations and projects, and the resulting network structures of the Commission’s Framework 7 (FP7) programme. To address the evaluative questions of DG INFSO, this model, extrapolated into the future without any policy changes, is taken as an evidence-based benchmark for further experiments. Against this baseline scenario the following example policy changes are tested: (i) What if there were changes to the thematic scope of the programme? (ii) What if there were changes to the instruments of funding? (iii) What if there were changes to the overall amount of programme funding? (iv) What if there were changes to increase Small and Medium Enterprise (SME) participation? The results of these simulation experiments reveal some likely scenarios as policy options for Horizon 2020. The paper thus demonstrates that realistic modelling with a close data-to-model link can directly provide policy advice. This paper has two objectives: its broader objective is to present a case study demonstrating that policy modelling using Agent Based Modelling (ABM) can assist policymakers in their decision processes; as a secondary objective, the paper examines a set of concrete research questions about the potential impacts of several European Commission research funding policy options. To address these two objectives, the SKIN model (Gilbert, Ahrweiler & Pyka 2014), is used for ex-ante impact assessment of Information and Communication Technologies (ICT) research in the Commission's research funding scheme, Horizon 2020. This was the subject of a tender study for the Evaluation Unit of the Directorate General for the Information Society and Media (DG INFSO) (http://ec.europa.eu/dgs/information_society/evaluation/index_en.htm). Policy modelling means to identify areas that need intervention, to specify the desired state of the target system, to find the regulating mechanisms, policy formation and implementation, and to control and evaluate the robustness of interventions (John 1998). The methodological difficulty is to bridge the gap between policy practice, often expressed in qualitative and narrative terms, and the scientific realm of formal models. Furthermore, policymaking in complex social systems is not a clear-cut cause-effect process but is characterised by contingency and uncertainty. To take into account technological, social, economic, political, cultural, ecological and other relevant parameters, policy modelling has to be enhanced and supported by new ICT-oriented research initiatives. What and how can modelling and simulation contribute to policy making in research and innovation? Worldwide, every year, governments spend billions on promoting research and development (R&D) and innovation (e.g. for the current funding scheme, Horizon 2020, covering the period 2014–2020, the European Commission will spend about €70B). Datasets and simulations for the policy-making community are needed that could be used to inform decisions by the European Commission and national Governments when they aim to support innovation. The first conceptual frameworks for understanding policy interventions in social systems were linear. This has been true for all policy areas, whether they be regulatory (Bulmer 2007), distributive (Eijffinger & Haan 2000), or coordinative. However, it began to be realised that the linear top-down idea of triggering a desired system performance on the macro level was clearly amiss (cf. Sabatier 2007). The resulting critique of the linear model led to concepts such as the garbage can model of policymaking (Kingdon 1984). Policymaking in complex social systems is characterised by contingency and uncertainty. These terms were used to criticise the principal-agent theory of policymaking following the observation that the principal is not able to control the agent but has a serious contractual problem (Braun & Guston 2003; Dinar et al. 2008). Policymakers face policy problems in contexts: an agent who is subject to certain strategic behaviours of other agents is located in a technological, regulatory, political, economic context, has a certain experience and history of others' strategic behaviours, is situated in a certain competition/cooperation structure with other agents, is changing over time and so on. Furthermore, strategy formation is no longer a privilege of governmental actors. In most policy domains, the term "governance" hints at the fact that there are non-governmental actors involved in policymaking and control issues (Fukuyama 2004). The term "organisational governance" (Foss & Klein 2007) refers to the fact that coordination mechanisms appear from the interaction of participating agents in a sector. These strategies and coordination mechanisms might further interfere with desired goals and impacts of governmental policy strategies. The policy process can give rise to all sorts of positive feedback mechanisms: changes in policy lead to changes in actor behaviour, which can again invoke new policy problems. Alternative models, such as the neo-liberal model of policy making, therefore erased the notions of sequentiality and linearity, and centred instead on processes of recursive learning, self-organisation, and non-linear dynamics (Prasad 2006). 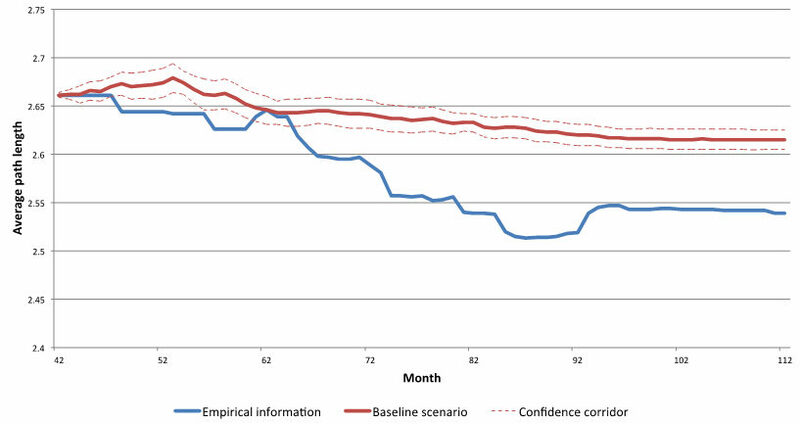 The problems with techniques that rely on the linearity of societal processes and predictability of future states inferred from past data and estimated from simple explanatory models such as forecasting (cf. Kress & Snyder 1994; Makridakis et al. 1998; Rescher 1998) have been discussed along the same lines. For an evidence-based (Davies et al. 2000; Pawson 2005) and computational approach to policy design we need the ability to identify potential futures (Clapham et al. 1980). Since it is impossible to predict future system states due to the underlying complex micro dynamics of social systems, even for foresight exercises (Loveridge 2007), it would not be reasonable to insist on examining the most likely future scenario but to compare and analyse interventions, their side effects, their bottlenecks and constraints in a set of possible future developments. Reviewing the current state-of-the-art of policy context analysis such as forecasting, foresight, backcasting, impact assessment, scenarios, early warning systems, and technology roadmapping (see literature review in CROSSROAD State-of-the-Art Analysis 15.04.2010 , pp. 143–163), the need for policy intelligence dealing with complexity becomes more and more obvious. "There is a gap of appropriate tools and technologies to support existing and well established methodologies for policy context analysis and strategic planning. Besides, often only isolated applications exist, which are strongly customized to a specific purpose and, therefore, cannot be reused for different purposes. Hence, scalability of current tools and technologies in the field of policy context analysis and strategic planning is very low" ( CROSSROAD Final Gap Analysis Report, 13.08.2010, p. 54). A particular challenge is the relationship between large-scale quantitative data and formal policy models. This is a twofold issue: First, providing knowledge discovery and data mining techniques for large and heterogeneous databases is generally required for policy analysis. Second, to connect these large databases to formal models constitutes a methodological gap in the existing state-of-the-art. It allows for considering innovations as real novelties. The traditional methodological framework referring to optimal decision making is no longer applicable. Policy design and evaluation methods in this area are challenged by the imponderability of research and innovation, which are characterised by true uncertainty and are exposed to failures (Knight 1921). Therefore, optimization approaches are not suited; instead innovation research has to acknowledge the possibility of novel behaviours (including failure) as a likely outcome, which, however, might be considered as an important source of knowledge to guide further research. Recent studies of networks and their dynamics indicate that the success of innovation networks is related to their specific structures as well as the mechanisms of network evolution. The emergence of these network structures and their underlying dynamics are not accessible with numerical simulations. There is scope for the improvement of the policy instruments used to create and to support innovation networks. In this paper we introduce agent-based modelling as an alternative approach which allows for the explicit consideration of true uncertainty in innovation as well as the interaction of heterogeneous agents in research and innovation networks (Fagiolo & Pyka 2007). Our model (Simulating Knowledge Dynamics in Innovation Networks, SKIN) allows users to address questions that involve different levels of the innovation ecosystem: from start-up firms (micro level) to academic-industry partnerships (meso level) to whole sectors or regions (macro level). It also can be calibrated using large empirical data sets. "SKIN is a multi-agent model containing heterogeneous agents that act and interact in a complex and changing environment. The agents represent innovative actors who try to sell their innovations to other agents and end users but who also have to buy raw materials or more sophisticated inputs from other agents (or material suppliers) in order to produce their outputs. This basic model of a market is extended with a representation of the knowledge dynamics in and between the agents. Each agent tries to improve its innovation performance and its sales by improving its knowledge base through adaptation to user needs, incremental or radical learning, and co-operation and networking with other agents" (Gilbert, Ahrweiler & Pyka 2010, 235). SKIN is grounded in empirical research and theoretical frameworks from innovation economics and economic sociology. It is the result of a number of projects that combined empirical research into innovation networks with agent-based simulation. The work started with the EU project "Simulating self-organising Innovation Networks" (SEIN). This project combined five empirical case studies in different sectors of technological innovation and in different EU member states with agent-based simulation of these case studies. The results of the SEIN project are summarised in Pyka and Kueppers (2002). Case studies described knowledge-intensive European industry sectors such as the biotechnology-based pharmaceutical industry in France (Pyka & Saviotti 2002), combined heat and power technology networks in The Netherlands, Germany and the UK (Weber 2002), knowledge-intensive business services in the UK web design industry (Windrum 2002), and the UK Virtual Centre of Excellence in the European telecommunication industry (Vaux & Gilbert 2002). The task of the SEIN project was threefold: theory formation, empirical case studies, and agent-based simulation. The objective was to derive a theory of innovation networks from insights derived inductively from the case studies and to implement this theory of innovation networks into an agent-based model. The result of the modelling activities was a model grounded in empirical research and informed by empirical data coming from the case studies (Gilbert, Pyka & Ahrweiler 2002). The model was used by the European Commission for scenario modelling of current and future innovation policy strategies (Ahrweiler, de Young & Windrum 2002) referring to the technological sectors and EU Member States of the case studies. In this respect, the model is currently unique in its field (cf. Watts & Gilbert 2014). In the INFSO-SKIN application, agents are R&D organisations (universities and research institutes), R&D departments in Large Diversified Firms (LDFs) and Small and Medium sized Enterprises (SMEs). Each agent has a kene, which in this case is a "quadruple". A quadruple includes the following elements: Research Direction (RD) represented by an integer, Capabilities (C) represented by an integer, Abilities (A) represented by a real number and Expertise (E) represented by an integer. The research direction (RD) represents the general knowledge orientation, which can be related to basic or applied research. A value of 0 indicates completely theoretical knowledge (i.e. basic research); higher values indicate an increasingly applied orientation; a value of '9' means exclusively applied research. For every knowledge field, applied as well as fundamental research directions exist. These research directions are included in the actors' quadruples to allow for a differentiation between e.g. university and firm actors. The capabilities (C) represent different knowledge areas and technological disciplines e.g. biochemistry, telecommunications or mechanical engineering. For modelling purposes the number of different capabilities has to be chosen to be large enough to cover all potential research areas that are encompassed in the European Framework Programmes. The knowledge space is structured: for example 800 different capabilities are divided equally among each of eight themes. The ability (A) represents the actors' specialisation in the capabilities' fields. In biochemistry, for instance, abilities are protein design, genomics, combinatorial chemistry, bioinformatics, filtering etc. The expertise (E) stands for the advancement of an actor's skills in the respective knowledge field. In INFSO-SKIN, three different types of agents: research institutions including universities (RES), large diversified firms (LDFs) and small and medium-sized enterprises (SMEs), are implemented; see Table 1. The general behaviour of the agents follows an empirical understanding of the phases in network formation and evolution of the Framework Programmes, which was previously the subject of a SKIN study using the SKEIN model "Simulating Knowledge Dynamics in European-funded Innovation Networks" (Scholz et al. 2010). The remainder of this section details the procedures followed by the agents. The type of instrument. This may either be IP or STREP; IP stands for "Integrated Project" and is the funding scheme for financing large projects with many partners; STREP stands for "Specific Targeted Research Project" and is the funding scheme for financing comparatively small consortia. The instrument specifies the minimum number of partners in a consortium, the composition of partners, and the length of the project. The date of Call (to determine the deadline for submission). A range of capabilities, a sufficient number of which must appear in an eligible proposal (how many is sufficient depends on the type of instrument, e.g. lower for a narrowly focused STREP than for a IP with a broad scope). The funding available for this Call. The number of projects that will be funded. The desired basic or applied orientation. The agents form project consortia. Partner choice mechanisms apply. Firstly, the agent looks at the list of its previous partners. Secondly, previous partners that agreed to join the proposal can add previous partners from their list. Thirdly, new partners will be searched for. The search process is guided by the requirements outlined in the Call, a list of capabilities. The proposal is considered to be eligible only if a sufficient number of these capabilities appear. If no agent from the list of previous partners can contribute such a capability in the first iteration, then in the second iteration previous partners of those agents that agreed to join the proposal can ask their previous partners. If the required capability is still not found, the proposal consortium can search for the knowledge in the population of all agents. This is done on a random basis. 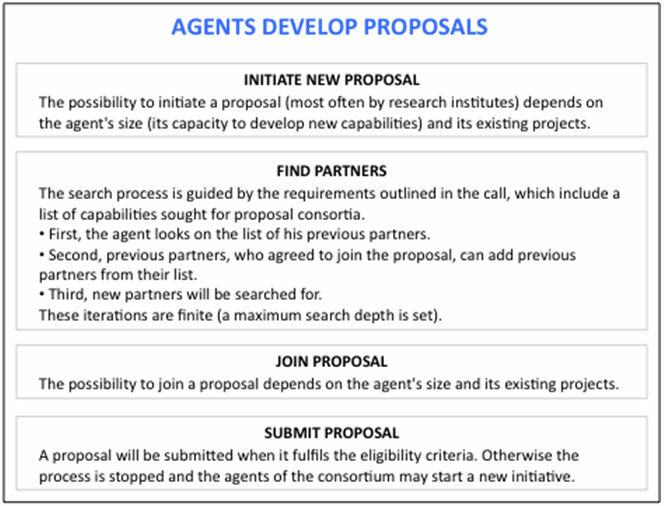 During each iteration, \(n\) agents can be asked whether they have the respective capability and whether they want to join the proposal consortium. 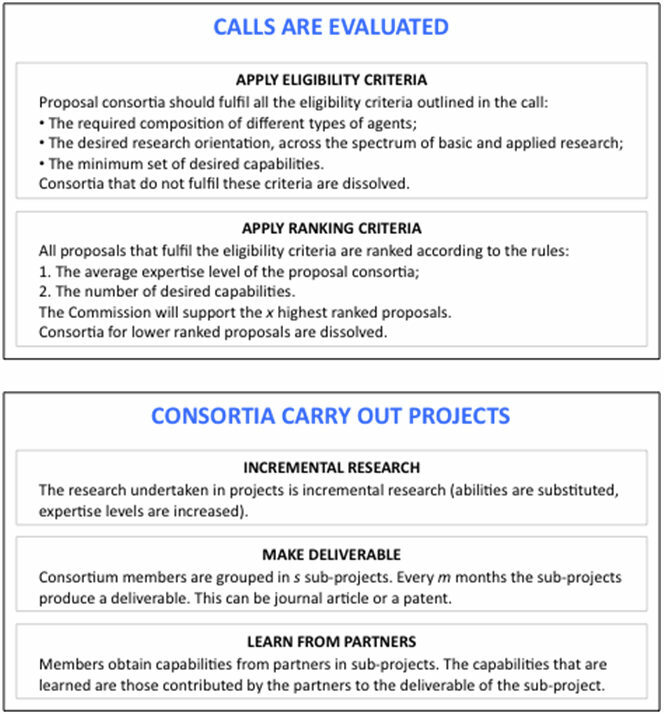 The possibilities to join a proposal consortium are determined by the same rules as for the determination of project initiations (see next step). The length of the kene determines whether the agent has free capacities for new activities. For example, an SME, whose kene is of minimum size (i.e. five quadruples) and which is already in a project or a proposal consortium has to reject the offer. The agents in a collaboration produce a proposal, representing the relevant knowledge of the partners. The consortium submits the proposal to the Commission. Each agent contributes one or more capabilities. The upper bound on how many capabilities an agent can contribute depends on the size of the agent's kene. If the agent has only one of the capabilities specified in the Call, it contributes this capability. If the agent has none of the required capabilities, it declines to join. A proposal will be submitted if a sufficient number of capabilities appear. The Commission evaluates the proposals according to a template that emphasises the contents (programme match), and the quality and architecture of the consortium (e.g. minimum number of members, industry involvement etc.). Proposals need to have sufficient partners with a sufficient number of capabilities as specified in the Call to be considered eligible. All proposals that fulfil the eligibility criteria are then ranked according to the average expertise level of the proposals (i.e. the expertise levels of the capabilities are summed and divided by the number of quadruples in the proposal). If some proposals turn out to have the same average expertise level, the tied proposals are ordered according to the number of the capabilities in the proposal that were specified in the Call. If, after the application of this rule, proposals are still ranked equally, one of them is selected at random. As many proposals as specified in the Call are then selected working down the ranked list. Proposal consortia that are not successful are dissolved. Those consortia that are selected start their projects. We define an iteration of the simulation to correspond to one month. This allows us to represent all processes in a reasonable order. For example, when a new Call is published, the deadline for a proposal is six months away, i.e. the agents have six time steps to set up a consortium and to "write a proposal". Another example is the length of research projects (e.g. three years, giving 36 iterations for consortium members to improve and exchange knowledge.) Picture A1 in the Appendix shows a flowchart of the above model narrative; Picture A2 details each step. for the Framework, a (global) value for total funding is set. for Calls, the available funding is set as a percentage of the total Framework funding. in the evaluation of proposals, the number of projects that will be funded depends on the required contributions for the highest ranked eligible proposals and the available funding for the call. The Instruments are pre-defined at the model set-up. Differences between the Instruments are defined by the set of parameters that can be adjusted before running the simulation (List 1 of the Appendix). The list of Calls is pre-defined at the model set-up, according to the list of Instruments. The set of parameters for each Call can be adjusted before running the simulation (List 2 of the Appendix). 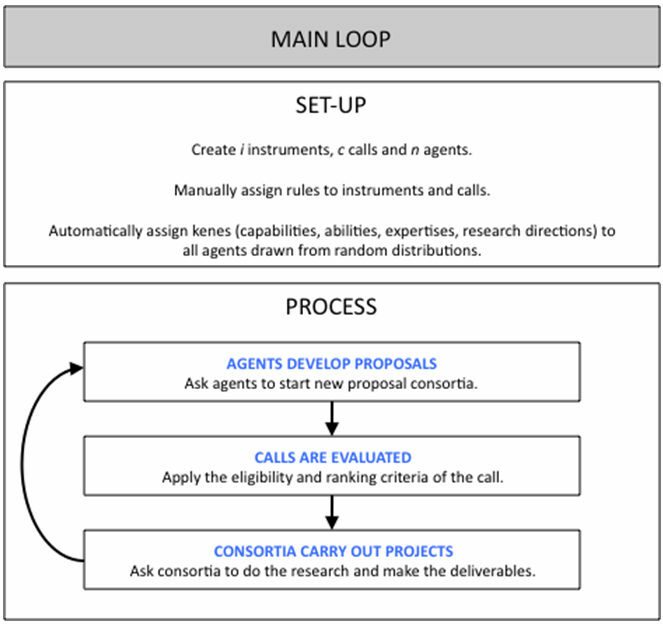 In response to the (open) Calls, the agents create new proposals and recruit their partners. Meanwhile (and as result of their interactions), the agents develop their kenes. The model's interface provides information about the overall collaboration network of the programme, the nodes being the organisations that are beneficiaries of funding and the edges being the links to their partners. This network has certain structural properties (List 3 of the Appendix). 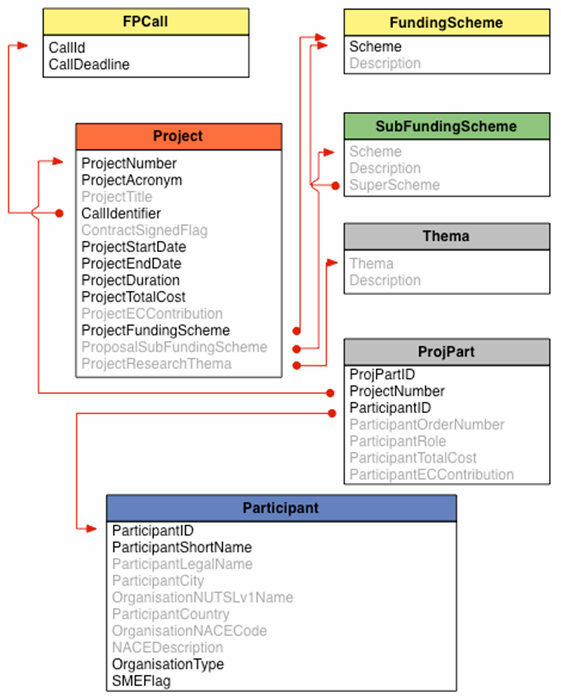 In addition to these measures about the collaboration network, the model's interface provides several statistics on the participants, proposals and projects over the course of the simulation (List 4 of the Appendix). 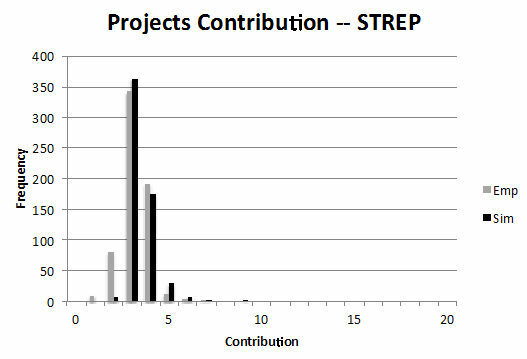 The statistics on project consortia provided by the model's interface (List 5 of the Appendix) help to interpret the collaboration network measures (e.g. a high percentage of small projects can explain a low network density). To find a realistic starting configuration, the model was calibrated using an existing database of the ICT project networks funded by DG INFSO. Figure 2 shows the structure of the database. First, a list of IP and STREP projects from the first FP7 call is retrieved from the database. Agents (research institutes, diversified firms and SMEs) are created, based on the organisations that are listed as participants of these projects. Links are created between all the members of the projects. To give the opportunity for the network to grow by connecting so-far unconnected agents to the existing (starting) network, additional agents are then created up to a user-specified number. In reality, there are many research organisations that write proposals which are not then funded. However, the DG INFSO database contains no data about such organisations. We therefore had to estimate the number of additional agents (we used 3000) that is sufficient to allow the network to grow. These additional agents are not part of the starting network. Figure 2. Database structure from DG INFSO for starting networks in INFSO-SKIN. Highlighted items were used to calibrate the simulation. Participant size, a measure of the capacity of organisations to interact and exchange knowledge, is based on total FP7 funding, information read from the DG INFSO database. For very large participants (such as the French CNRS, which encompasses many research groups and centres located throughout France), multiple agents (proportional to the funding) were created to represent the organisation. 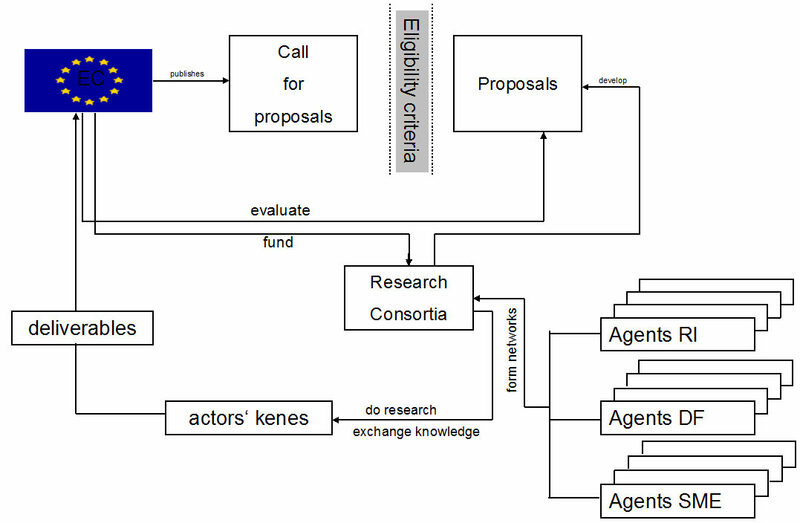 Agents are endowed with their initial kenes (capabilities, abilities, expertise levels and research directions) using randomised designs for the agent types, based on the model's partitioning (with 9 themes, common/rare capabilities) of the knowledge space, in a way that results in a distribution similar to that shown in Figure 3. The Calls of FP7 cover eight thematic areas, but one extra is created in order to accommodate the first policy experiment, which examines the effect of increasing the coverage with an additional theme. The ninth theme is left unpopulated in all the other experiments. Instruments and Calls are then created to complete the setup procedure. For the Calls 1–6 that have actually occurred in FP7, we have data on the number of participants (funded organisations differentiated between research institutes (RES), large diversified firms (LDFs) and small and medium sized enterprises (SMEs)), and the number of funded projects. Furthermore, we have information on the size of the projects as measured by the number of participants, the duration of the project, and the average funding per project. Analysing this information provides empirical information on important network indicators. These numbers can be used to calibrate and validate the model. The number of replications used for calculating statistics about the Baseline Scenario and each of the experiments is 15. This is sufficient for convergence and yields a small enough confidence interval for the set of indicators used (see Figure 4). The issue of the number of simulation replications is covered in Robinson (2004, Chapter 9). 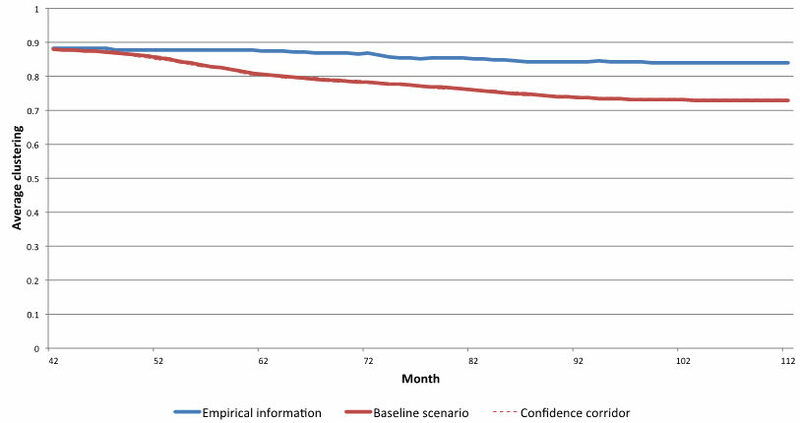 The simulated data for the Baseline Scenario is summarized using corridors marking the 95% confidence interval around the mean (Figure 5). Most of the plots for each of the 15 replications will lie within this corridor. Note that the summarizing tables in this paper only present the end value (after 112 months) and the standard deviation. Comparing the empirical and – for the Baseline Scenario – the simulated data, the next two tables below summarise all values per instrument (IP and STREP). The values where we have empirical information are in bold. Values for the empirical "unobservables" (proposal writing activities, the amount of knowledge held by the agents, and knowledge flows between the agents in the network) are in italic and can be obtained only from the simulation. Tables 2 and 3 confirm that the model achieves a good match between the empirical and the simulated number of participants and projects. 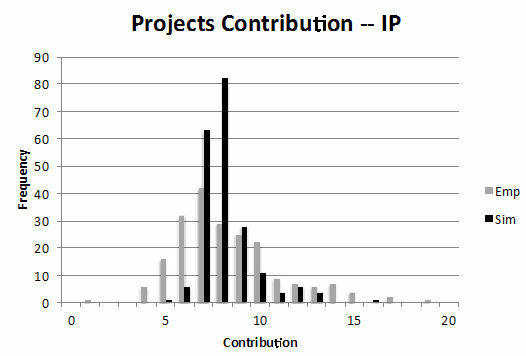 Figure 6 shows the distributions of number of participants per project (project size) and funding per instrument (project contribution) for the Baseline Scenario and for the empirical data. 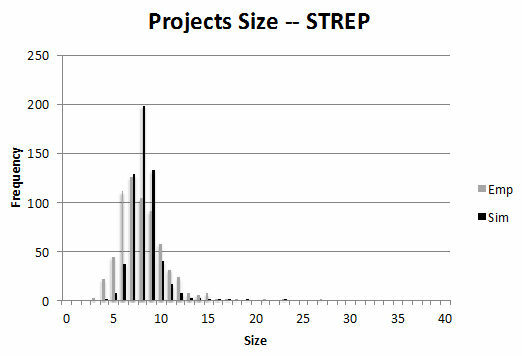 The figures illustrate the distributions of the number of actors in consortia (project size) and the financial size of projects (project contribution). For both STREPs and IPs, we observe a few large consortia and financially larger projects. There are some very large IP projects in the empirical data in the first of these four figures. We consider them to be a consequence of administrative actions by the Commission, merging certain projects, not an endogenous outcome. The empirical information on participants and projects is more or less matched by the calibrated simulation. 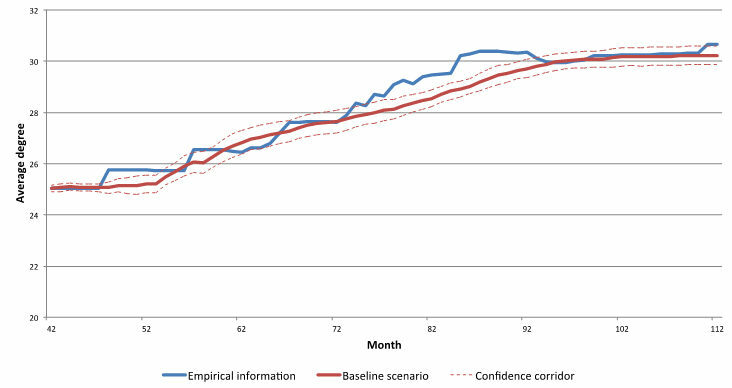 The development of the empirical largest component and of the largest component of the simulated baseline scenario over the 112 months of the simulated Programme is displayed in Figure 7. This indicator comprises the number of agents who can in principle be reached by traversing links between agents within the largest coherent part of the network. One of the basic aims of Framework Programmes is to contribute to the establishment of a European research landscape and the size of the largest component can be interpreted as a measure of the achievement of this goal. 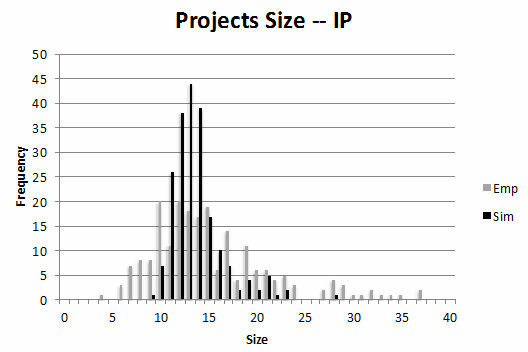 The largest component remains at the initial size for 42 months and only then starts to increase because of an artefact: in the simulation, participants announce their updated partner lists only once a project has finished, which correspond to a six months proposal writing period plus 36 months project work after the first Call has been published. Note. Due to the small number of replications, the corridors in this and next figures were constructed using t-based confidence intervals (95%). The second indicator is the network density, which describes the overall level of linkage among the actors. It is the number of links between actors, expressed as a percentage of the maximum possible number of links. The indicator measures the effects of policy interventions on the extent and speed of knowledge diffusion in the network. Higher density values indicate faster potential diffusion of knowledge; lower values indicate a reduction in the potential speed of diffusion. Although the interpretation of the density is straightforward, one has to keep in mind that it is a relative measure and its magnitude depends on the overall network size. Therefore, densities of networks of different sizes cannot be compared. As indicated by the growth of the largest component we are confronted with growing networks, which lead to a decreasing density over time (Figure 8). The average degree and the degree centrality are widely used indicators from Social Network Analysis, especially in cases where large networks of varying sizes are analysed. The average degree simply divides the sum of the number of connections of every agent by the number of agents and gives a rough idea of the overall direct connectivity of the agents, an indicator of the cohesion of the network. Figure 9 shows the empirical and simulated development of the average degree. Because the degree is increasing in later periods we conclude that the cohesion of the network increases despite the decreasing density. However, the stage of development of the network's knowledge base also matters. In early exploratory stages the average degree might decrease because new actors bring in new knowledge fields; for more mature knowledge bases, a decreasing average degree might indicate a dissolving network. The structure of the research networks referring to the various knowledge fields and their connections can be approximated by the average clustering coefficient of the network. Higher clustering coefficients indicate that research networks are characterized by highly connected subgroups of agents that are only loosely connected by few linkages. For such networks, actors who might act as boundary spanners can be critical for the transmission of ideas. Figure 10 illustrates that in the simulated networks, clustering is decreasing and therefore structural holes between different knowledge areas are increasingly closed. The average path length is defined as the average number of steps along the shortest paths between all possible pairs of agents in a network. In the case of knowledge transfer, the quality of knowledge exchange processes is negatively affected by increasing path length. Figure 11 displays, for both the baseline scenario and the real network, the development of the average path length. In both cases, there is a decrease in average path lengths over time. 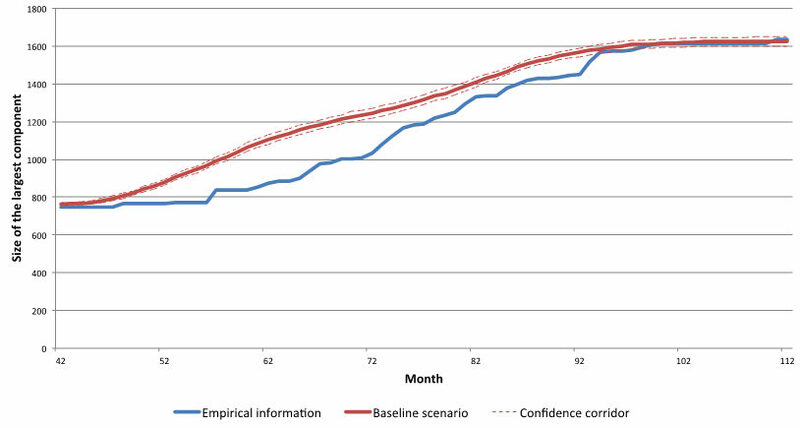 This result can be interpreted as a success for network policies in FP7. 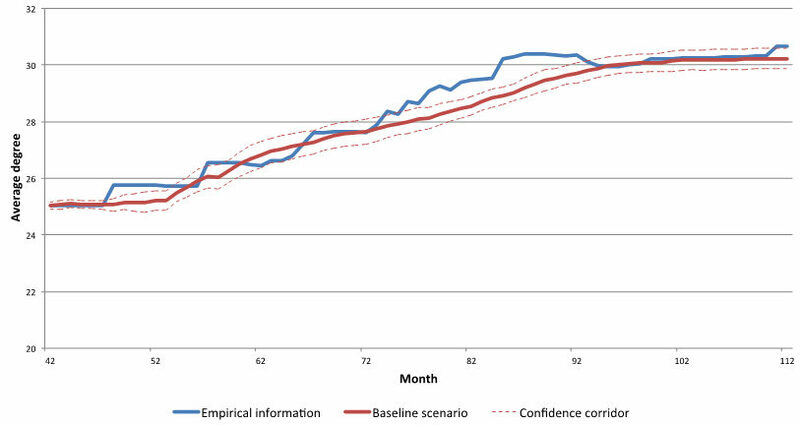 In Figure 11, the empirical trend is stronger than the simulated one; the difference can be traced back to the construction of the database, which only includes actors in consortia whereas the simulated data also includes unconnected actors, leading to the relatively higher values of this indicator. 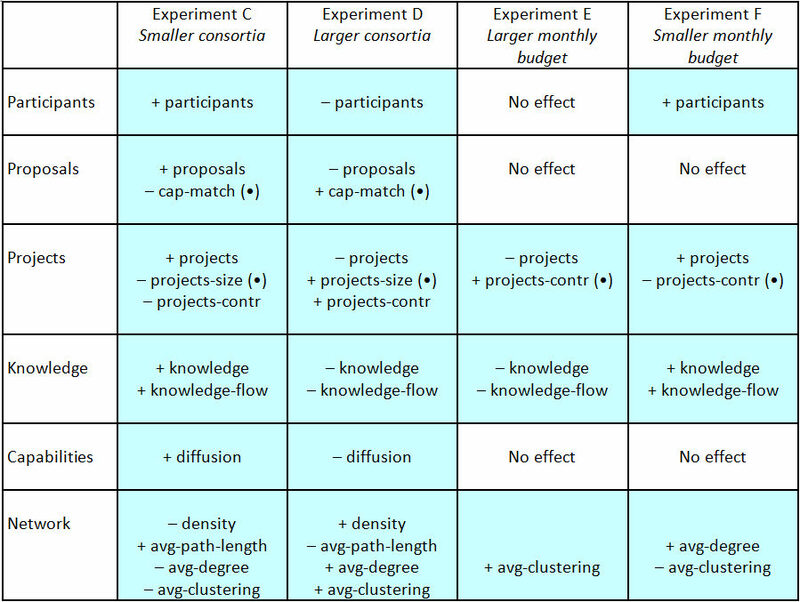 In the tables for the experiments that follow in the next section, there are two indicators listed: the actual number of proposals (proposals), and the thematic match between proposal requirements in terms of knowledge capabilities and the capabilities recorded in the submitted proposals (cap-match). The number of proposals produced in the simulation is about double the number of projects that are funded. This means a model success rate for proposals (IP and STREP) of approximately 50%, which is well above the empirical success rate of 20% according to FP7 subscription statistics (source: FP7 Subscription, Performance, Implementation report, 2007–2008). However, in this case we do not need an empirical match, because the agent population in the simulation does not mirror the number of all potentially participating organisations in the European funding landscape that could theoretically submit proposals. We just need a realistic evaluation procedure with the acceptance conditions for submitted proposals set so that the number and size of accepted proposals (= funded projects) match as closely as possible the empirically recorded number of projects and the empirical size distribution of projects. An additional indicator focuses on the qualitative composition of the networks' knowledge bases. Modifying the call for proposals and asking for different knowledge areas to be involved might exert an influence on the depth and breadth of the agents' knowledge base. This is measured with the number of shared capabilities among the agents. We implemented an indicator (diffusion) to track the diffusion of capabilities based on the information in Table 4. Figure 12 shows the Baseline Scenario values for the diffusion of capabilities. Note the lower diffusion value for capabilities from theme 9, which is not included in the Calls. The discussion above shows that the networks created by DG INFSO in FP7 and those created by the agent-based model are qualitatively similar. The simulation experiments reproduce the empirical data and cover the decisive mechanisms and resulting dynamics of the real networks. This qualifies the model to be used for in silico experiments, which take these outcomes as a starting point and test potential future developments in the sense of the ex-ante evaluation outlined above. The first experiment simply prolongs the time horizon and keeps the instrument design as outlined in FP7. In other words the coming funding programme, Horizon 2020, is treated as a simple extension of FP7. The outcomes of this experiment, which we have labelled "Business as Usual", are outlined in the two Tables 4 and 5 below, one for the IP and one for the STREP case. We are interested in the effect on the number and composition of participants, the number of submitted proposals and the qualitative features of the underlying network structures. Analysing these outcomes allows for an ex-ante evaluation of FP7 instruments concerning their sustainability beyond the FP7 time horizon. At first glance, the results of the Business as Usual Experiment confirm the sustainability of FP7 policy designs. Extending policies beyond FP7 can be considered as a strategy that conserves the trends sustaining the networks. A closer look at the relevant figures, nevertheless, indicates some subtle changes that qualitatively affect the networks and the resulting dynamics. All the agent groups (RES, LDF and SME) are affected, i.e. their rate of participation grows, though the rates differ. The lowest growth rate of approximately 10% is for research institutes, perhaps because the majority of institutes are already in the networks. Large Diversified Firms (LDFs) are the second fastest growing group and extend their participation by approximately 13%. Again, most of the European LDFs, at least those including R&D departments, are already linked to the networks. The highest growth in participation is for Small and Medium Sized Enterprises (SMEs), which increase their participation on average by 17%. The strongest effect is on the number of proposals being submitted, which almost doubles in the extension experiment. There is no change in the average number of agents that join a proposal team. However, the average expertise characterising proposal writers decreases moderately, as a side-effect of the increasing proposal activity: agents with somewhat lower expertise levels manage to be included in proposal teams because of the scarcity of relevant competences. This scarcity can also be considered as a factor supporting SMEs with rare capabilities, relative to LDFs and RESs. The number of proposals that succeed in passing the evaluation of the Commission also increases, but only by half as much as the growth in the number of proposals. The increase in the rejection rate implies an increase in the quality of the projects. There are no significant changes to the average project size, duration or Commission contribution (the value of financial support per project). The quantity and quality of linkages among project consortium members moderately increases, which leads to increasing knowledge flows within the projects. With the larger number of agents in the networks, a decrease in the rate of knowledge diffusion was to be expected and, indeed, the capability diffusion slightly decreases. In total, however, the conditions for knowledge flows within the network and therefore for mutual learning and cross-fertilisations increase. The largest component – measuring the number of agents that are in principal connected in the network – increases by 12%, complemented by a moderate increase in the network density. The increase in the average degree from 30 to 35 reflects a more egalitarian distribution of linkages caused by the higher participation of SMEs and a higher number of projects. These developments lead to a decrease in the clustering in the network, which corresponds to a somewhat decreasing influence of LDFs. To summarise, Business as Usual shows that under a continuation of FP7 policies networks not only survive but grow, while the structure of those networks tends to evolve towards a more balanced distribution of influence between agents, and the networks become more effective at producing proposals. In helping to design the new Horizon 2020, DG INFSO had the opportunity to consider new policy options, such as supporting certain funding instruments more strongly, accentuating some aspects, and addressing new topic areas in order to initiate the emergence of new industries and scientific fields. The following policy changes were tested for ex-ante evaluation of the new programme: (i) What if there would be changes to the thematic scope of the programme? (ii) What if there would be changes to the funding instruments? (iii) What if there would be changes to the overall amount of programme funding? (iv) What if there would be changes to increase SME participation? The results of the experiments have to be understood against the baseline scenario, the reproduction and dynamic extension of FP7 (the "Business as Usual" Experiment above). The outputs (baseline scenario and the scenario under investigation) were compared using an independent two-sample t-test with equal sample sizes and unequal variance. Comparisons that are noted as statistically significant are those with \(p\) values less than 0.05. There are many dimensions of the network evolution that can be used for the comparisons. In order to cover the multi-facetted aspects of our explanandum – the networks and their dynamics – we tabulate the four experiments and the effects of the modified policy design in six rows (see Table 6). The heads of the columns label the different experiments performed, and the rows are labelled with the variables under investigation. In the first row the effect on the number of participants and their rate of participation in the networks is listed. In particular we differentiate between research institutes (RES), large diversified firms (LDFs) and small and medium sized enterprises (SMEs). An increasing rate of participation is indicated with a plus, while a minus indicates a decreasing participation rate. The second row lists the number of proposals, and whether there is an increase in proposal writing activities (plus) or a decrease (minus). This figure is of interest as the number of proposals submitted can be interpreted as an indicator determining the potential for network growth. In the third row, the effects on the projects are listed. Especially, we differentiate between the number of projects, the size of the projects as measured by the number of participants, the proportion of each agent type, and the average funding per project. 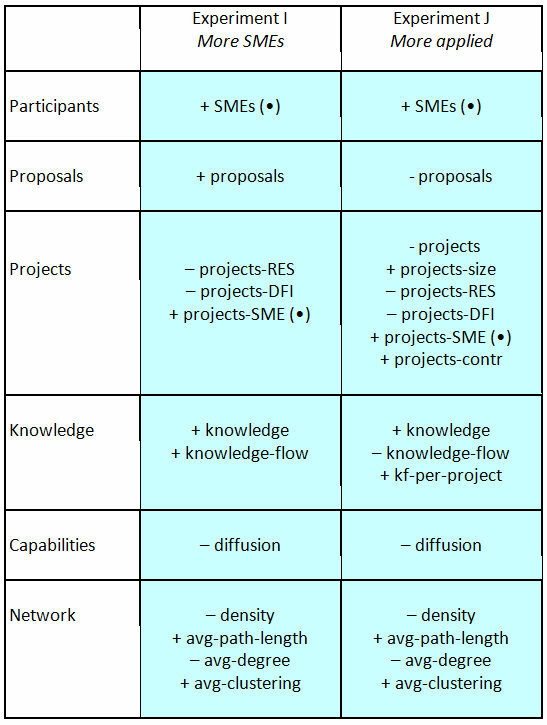 The respective figures can be used to evaluate the effects of various sizes and forms of project consortia on the overall network evolution. The fourth row deals with the effects of knowledge exchange processes measured as knowledge flows between the agents in the networks. The modifications in the various experiments can lead either to increasing or decreasing mutual learning triggered by knowledge flows and therefore allows for the evaluation of the effectiveness of various policy designs for knowledge diffusion. The last row deals with the network as a whole. To illustrate deviations from the baseline scenario, the effects of the experiments on important network indicators are documented in the table and their development over time is displayed. Any statistically significant deviation from the Baseline Scenario for these indicators is marked by a plus (+) or a (-). No significant effect is recorded by the entry "no effect" in the respective cell. Current EU funding programmes put considerable emphasis on tackling societal challenges through the encouragement of specific technology themes, bringing researchers from across Europe together in collaborative networks. Understanding how the network will react to changes in this "thematic technology push" approach is crucial for an ex-ante evaluation of networks built through collaborative research at a European level. The first pair of experiments, A and B (cf. Table 6) were designed to establish the impact of changing the number of technology themes supported by FP funding. 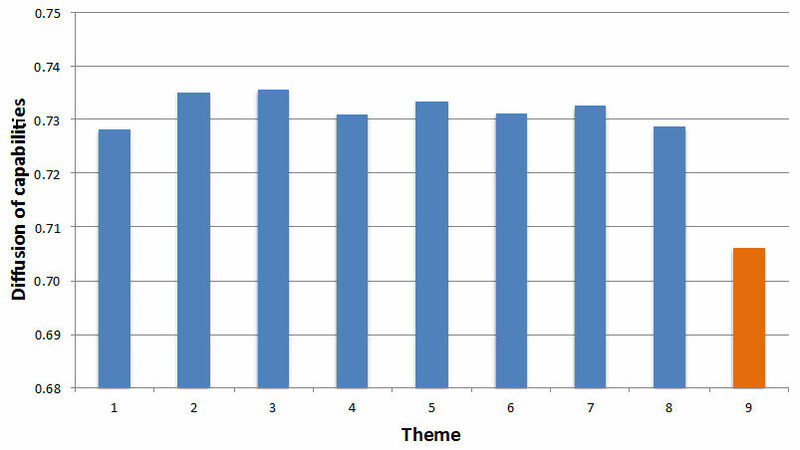 Specifically, they looked at what happened if the number of thematic areas was increased or reduced by one. Intuitively, changing the number of knowledge fields should alter the overall transfer of knowledge with the network, because the likelihood of agents with similar knowledge meeting within the network will vary with the number of knowledge fields included. Table 7:. Results - Programme Scope Scenario (all variable acronyms are listed and defined in Tables 1–5 of the Appendix). Surprisingly the simulations showed that neither broadening nor narrowing the scope of the Calls made a discernible difference on the composition or structure of the observed networks. Minor changes in the membership of the networks were observed, however, with intriguing consequences. Narrowing the scope encouraged greater clustering of SMEs, a network structure supportive of exploitation activities. Broadening the scope, however, encouraged greater clustering of large diversified firms (LDFs), which, by connecting different knowledge niches, tends to support innovation. The implication is that new thematic areas could be integrated (or existing areas deleted) without any significant effect on existing networks. So the decision to add or remove thematic areas – within the parameters modelled – can be driven solely by political considerations. It is a decision on the direction and desirable focus of research. Given that the intended changes remain within a non-critical corridor, it is not likely that the inclusion or exclusion of themes will cause problems for the achievement of targets relating to the density and size of the networks. An obvious policy instrument is to change the amount of funding – either per Call or per project. This echoes question 5 of the public consultation on Horizon 2020: "What should be the balance between smaller, targeted projects and larger, strategic ones?" (Green Paper on a Common Strategic Framework for EU Research and Innovation Funding: Analysis of public consultation 2011: p. 8). One of the suggestions was that funding opportunities should allow for smaller projects and consortia because these encourage more innovation. Four experiments, C, D, E and F, were conducted (see Table 6). C and D focused on the effect of the number of capabilities required by a proposal submitted in response to a Call (in other words, the required size of the responding consortium). E and F focused on the effect of varying funding levels per project. Experiment C focused on the effect of reducing the consortium size. It found striking increases in the number of participants in the network, the number of proposals delivered and the number of projects eventually supported by the Commission. Because smaller consortia limit the capacity of consortia to respond to Calls, and because agents regard EU funding as important, they make more proposals to increase their chances of funding. Accordingly, decreasing consortia size but maintaining overall funding allows a greater number of projects to be supported. The study found evidence that knowledge flows within the networks increased, while the network structures became more egalitarian. Experiment D focused on a policy encouraging larger consortia. The effects of this were to decrease the number of members in the network, the number of proposals submitted, and the number eventually supported. It is clear that this has negative effects on the egalitarian relationships found in experiment C (which disappear) and also on the knowledge flows and overall diffusion of skills within the network. Encouraging larger consortia tends to favour LDFs and Research Institutions (RES) over SMEs, which are likely to move to the network periphery. Experiments E and F deal with the effects of varying funding levels per project. Experiment E simulated an increase in monthly budget per project, while experiment F introduced a smaller monthly budget. The effects of increasing the budget were disappointing. Far from encouraging activity, an increased spend actually has no effect on the number of participants and the number of proposals. Knowledge flows within the networks decrease, as with a smaller number of projects there is less scope for knowledge transfer. Table 8:. Results - Hubs and Spokes Scenario (all variable acronyms are listed and defined in Tables 1–5 of the Appendix). In summary, the results show that smaller consortia sizes and (to a lesser extent) lower monthly funding rates had a beneficial effect on the formation of research networks. While larger projects with extremely high funding may be required for other reasons, they do not seem to be supportive of the network-related goals. Of course, other aims in the underlying research policy might require designs favouring larger projects. Rather than changing the funds available per participant, the funds per Call can be varied, leaving the average funding per project participant unchanged. Experiment G increased the available Programme funding by 10% and experiment H decreased it by the same amount. Table 9. Results - Elite or Selectivity Scenario (all variable acronyms are listed and defined in Tables 1–5 of the Appendix). Unsurprisingly, we found that decreasing funding leads to more competition for the smaller number of available projects. A larger number of proposals are submitted, but a smaller number of consortia are successful. This can be interpreted from the evaluator's side as being more selective and demanding a higher quality of project proposals. Compare this with an increase in funding, which leads to more projects being funded, more knowledge flows between actors, and stronger connections between consortia. SMEs play a crucial role in the development of new products and services because they are usually more flexible and agile than larger organisations. Considerable thought has been given by the Commission about how to make it more likely that SMEs will successfully join research networks. The final experiments consider how networks will be affected as a result of changed SME participation. In the Green Paper consultation process for Horizon 2020, respondents particularly emphasised the need to improve the opportunities for SMEs with innovation ambitions (Green Paper on a Common Strategic Framework for EU Research and Innovation Funding: Analysis of public consultation 2011: p. 10f). We constructed two experiments to assess the effects of increased SME participation in the networks. Experiment I considers the effect of having a larger number of SMEs participating in the programme. Experiment J changes the orientation of the evaluation criteria used to judge proposals so as to favour more applied work (which should favour SMEs). Table 10. Results - Specialisation Scenario (all variable acronyms are listed and defined in Tables 1–5 of the Appendix). As might be expected, there are more SMEs in the final network if there are more SMEs at the starting phase. However, there are also more proposals submitted, because it is easier for consortia to meet eligibility criteria – which often require SME participation. Overall there are not significantly more or less projects than in the Baseline Scenario, but there are significant differences in the consortium structures: with fewer research institutions and fewer large companies but more SMEs. Proposals involving SMEs, with their specialist knowledge, are more likely to be successful in this experiment, and as specialists they tend to edge out the universities and larger companies with their more generalized knowledge bases. The conclusion is that encouraging more SMEs to pitch for projects under FP Calls would in itself be a sufficient trigger to increase FP participation by SMEs. Also, policy changes to a more applied research direction would be helpful in encouraging more SME participation. To what degree can policy decisions be made on the basis of these conclusions, i.e. how accurate is the model? The model was calibrated from the Calls 1–6 that have occurred in FP7. The model used empirical information on the number of participants and the number of funded projects, together with data on project size (as measured by participant numbers), duration and average funding. Analysis of this information produced data on the functioning of, and relationships within, actual collaborative networks within the context of the Framework. 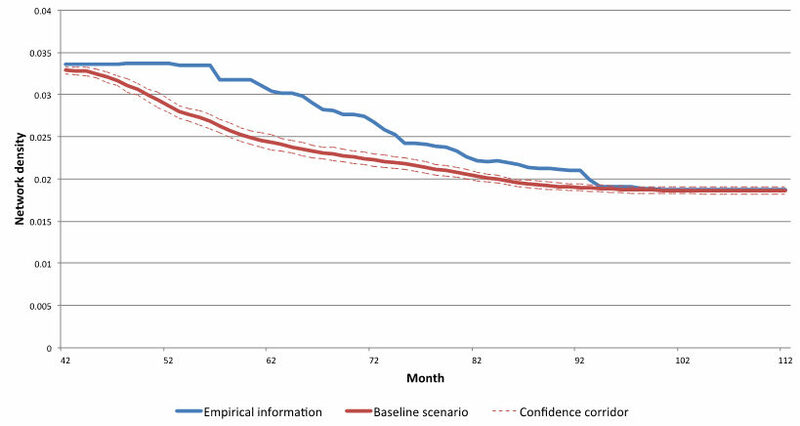 Using these data in the model, we were able to achieve a good match with the empirical data from EU-funded ICT networks in FP7: the model accurately reflected what actually happened. The fact that the simulation experiments using the empirical data closely match what happened gives us more confidence that the model can be used as a test bed for potential policy choices. The Final Report of the commissioned tender study was presented to the EC with a list of policy recommendations (Ahrweiler et al. 2012). It was discussed at a study workshop with the EC policymakers of DG INFSO and was accepted by the EC Cabinet soon afterwards. With this, INFSO-SKIN has contributed to show that ABM is appropriate to assist policymakers in their decision processes in terms of consensual quality assessment by the "user community view" (cf. Ahrweiler & Gilbert 2005). This research was financed by a tender grant of the DG Information Society and Media of the European Commission (DG INFSO). The authors are especially grateful for access to the DG INFSO database on FP7 held by the Evaluation Unit, which commissioned the study. 2The model and some accompanying information can be downloaded from the SKIN website at http://cress.soc.surrey.ac.uk/skin/component/jdownloads/category/6-skin-plus-model?Itemid=-1. The data described in this paper and used for calibration is, regrettably, not provided there because the originators, DG INFSO, were not willing to make the database generally available. AHRWEILER, P., de Jong, S. & Windrum. P. (2002). Evaluating Innovation Networks. I Pyka, A. & Kueppers, G. (Eds.). Innovation Networks – Theory and Practice. Cheltenham: Edward Elgar, 197-214. AHRWEILER, P., Gilbert, N. and Pyka, A. (2012) Final Report: Using Network Analysis to monitor and track Effect resulting from Changes in Policy Intervention and Instruments. SMART 2010/0025. European Commission, DG Information Society & Media. AHRWEILER, P., Pyka, A. 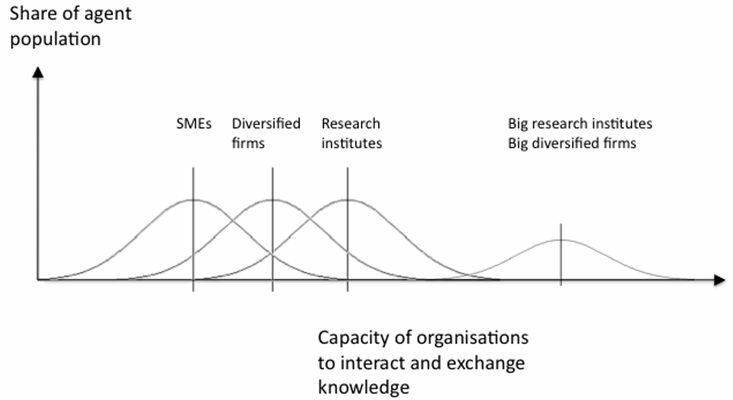 & Gilbert, N. (2011) A New Model for University-Industry Links in Knowledge-Based Economies. Journal of Product Innovation Management, 28(2): 218–235. BOZEMAN, B., & Lee, S. (2005) The Impact of Research Collaboration on Scientific Productivity. Social Science Studies, 35(5), 673-702. BRAUN, D., & Guston, D.H. (2003) Principal-agent theory and research policy: an introduction. Science and Public Policy 30/5. BULMER, S. (2007) Policy Transfer in European Union Governance: Regulating the Utilities. Routledge, Abingdon. CLAPHAM, W.B., Pestel, R.F., & Arnaszus, H. (1980) On the scenario approach to simulation modeling for complex policy assessment and design. IIASA Research Report RR-80-3,February 1980. Reprinted from Policy Sciences 1, 1979, pp. 157– 177. DAVIES, H. T. O., Nutley, S. M., & Smith, P. C. (2000) What works? Evidence-based Policy and Practice in Public Services. Cambridge. DINAR A., Albiac, J., Sanchez-Soriano J. (2008) Game Theory and Policy Making in Natural Resources and the Environment. New York: Routledge Press. EIJFFINGER, S. C. W., & de Haan, J. (2000) European Monetary and Fiscal Policy. Oxford University Press, Oxford. EUROPEAN COMMISSION (2011) Green Paper on a common strategic framework for EU research and innovation funding: Analysis of public consultation 2011. Report published by the Directorate-General for Research and Innovation (2011), ISBN 978-92-79-20325-1. FAGIOLO, G., & Pyka, A. (2007) Agent-based modelling: a methodology for a neo-Schumpeterian modelling, in: Hanusch, H., Pyka, A. (Eds) The Elgar Companion on Neo-Schumpeterian Economics. Edward Elgar, Cheltenham, pp. 467–492. FOSS, N., & Klein, P. (2007) Organizational Governance. Copenhagen Business School Working Papers. Copenhagen. FUKUYAMA, F. (2004) State Building. Governance and World Order in the Twenty-First Century. Ithaca. GILBERT, N., Ahrweiler, P., & Pyka, A. (2010). Learning in innovation networks: some simulation experiments, in: Ahrweiler, P. (ed) Innovation in Complex Social Systems. London: Routledge, pp. 235–249. GILBERT, N., Pyka, A., & Ahrweiler, P. (Eds.) (2014) Simulating Knowledge Dynamics in Innovation Networks.Heidelberg: Springer. JOHN, P. (1998) Analysing Public Policy. London. KINGDON, J. W. (1984) Agendas, Alternatives, and Public Policies. Little, Brown, Boston. KNIGHT, H. F. (1921) Risk, Uncertainty and Profit. Chicago. KRESS, G. J., Snyder, J. (1994) Forecasting and Market Analysis Techniques: A practical Approach. Quorum Books, Westport, Connecticut, London. LOVERIDGE, D. (2007) Foresight. The Art and Science of Anticipating the Future. Routledge, New York. MAKRIDAKIS, S., Wheelwright, S., & Hyndman, R. J. (1998) Forecasting: Methods and Applications. John Wiley & Sons, New York. PAWSON, R. (2005) Evidence-based Policy: A Realist Perspective. London. PRASAD, M. (2006) The Politics of Free Markets: The Rise of Neo-Liberal Economic Policies in Britain, France, Germany, and the United States. Chicago. PYKA, A. & Kueppers, G. (Eds) (2002). Innovation Networks: Theory and Practice. Cheltenham: Edward Elgar. PYKA, A. & Saviotti, P. P. (Eds) (2002). Innovation Networks in the Biotechnology-based Sectors. In Pyka A. & Kueppers, G. (Eds), Innovation Networks: Theory and Practice. Cheltenham: Edward Elgar, 75–107. RESCHER, N. (1998). Predicting the Future: An Introduction to the Theory of Forecasting. State University of New York Press, New York. ROBINSON, S. (2004) Simulation. The practice of model development and use. Wiley. SABATIER, P. A. (2007) Theories of the Policy Process (2nd edition). Westview Press, Boulder, CO.
SCHOLZ, R., Nokkala, T., Ahrweiler, P., Pyka, A., & Gilbert, N. (2010) The agent-based Nemo Model (SKEIN) – Simulating European Framework Programmes, in: Ahrweiler, P. (Ed) Innovation in Complex Social Systems, Routledge, London, pp. 300–314. VAUX, J. & Gilbert, N. (2002) Innovation Networks by Design. In Pyka, A., & Kueppers, G. (Eds. ), SInnovation Networks – Theory and Practice. Cheltenham: Edward Elgar, 55-74. WATTS, C. & Gilbert, N. (2014) Simulating Innovation. Computer-based Tools for Re-Thinking Innovation. London: Edward Elgar. WEBER, M. (2002) Innovation networks and the transformation of large socio-technical systems: the case of combined heat and power technology, in: Pyka, A., Kueppers, G. (Eds) Innovation Networks - Theory and Practice. Edward Elgar, Cheltenham, pp. 133–165. WINDRUM, P. (2002) The role of knowledge-intensive business services (KIBS) in e-commerce. In Pyka, A., Kueppers, G. (Eds.) Innovation Networks - Theory and Practice. Edward Elgar, Cheltenham, pp. 108–132.